śrī bhagavān uvāca—the Supreme Personality of Godhead said; ūrdhva-mūlam—with roots above; adhaḥ—downwards; śākham—branches; aśvattham—banyan tree; prāhuḥ—said; avyayam—eternal; chandāṁsi—Vedic hymns; yasya—of which; parṇāni—the leaves; yaḥ—anyone; tam—that; veda—knows; saḥ—he; veda-vit—the knower of the Vedas. After the discussion of the importance of bhakti-yoga, one may question, "What about the Vedas?" It is explained in this chapter that the purpose of Vedic study is to understand Kṛṣṇa. Therefore one who is in Kṛṣṇa consciousness, who is engaged in devotional service, already knows the Vedas. The entanglement of this material world is compared here to a banyan tree. For one who is engaged in fruitive activities, there is no end to the banyan tree. He wanders from one branch to another, to another, to another. The tree of this material world has no end, and for one who is attached to this tree, there is no possibility of liberation. The Vedic hymns, meant for elevating oneself, are called the leaves of this tree. This tree's roots grow upward because they begin from where Brahmā is located, the topmost planet of this universe. If one can understand this indestructible tree of illusion, then one can get out of it. This process of extrication should be understood. In the previous chapters it has been explained that there are many processes by which to get out of the material entanglement. And, up to the Thirteenth Chapter, we have seen that devotional service to the Supreme Lord is the best way. Now, the basic principle of devotional service is detachment from material activities and attachment to the transcendental service of the Lord. The process of breaking attachment to the material world is discussed in the beginning of this chapter. The root of this material existence grows upward. This means that it begins from the total material substance, from the topmost planet of the universe. From there, the whole universe is expanded, with so many branches, representing the various planetary systems. The fruits represent the results of the living entities' activities, namely, religion, economic development, sense gratification and liberation. Now, there is no ready experience in this world of a tree situated with its branches down and its roots upward, but there is such a thing. That tree can be found beside a reservoir of water. We can see that the trees on the bank reflect upon the water with their branches down and roots up. In other words, the tree of this material world is only a reflection of the real tree of the spiritual world. This reflection of the spiritual world is situated on desire, just as the tree's reflection is situated on water. Desire is the cause of things' being situated in this reflected material light. One who wants to get out of this material existence must know this tree thoroughly through analytical study. Then he can cut off his relationship with it. This tree, being the reflection of the real tree, is an exact replica. Everything is there in the spiritual world. 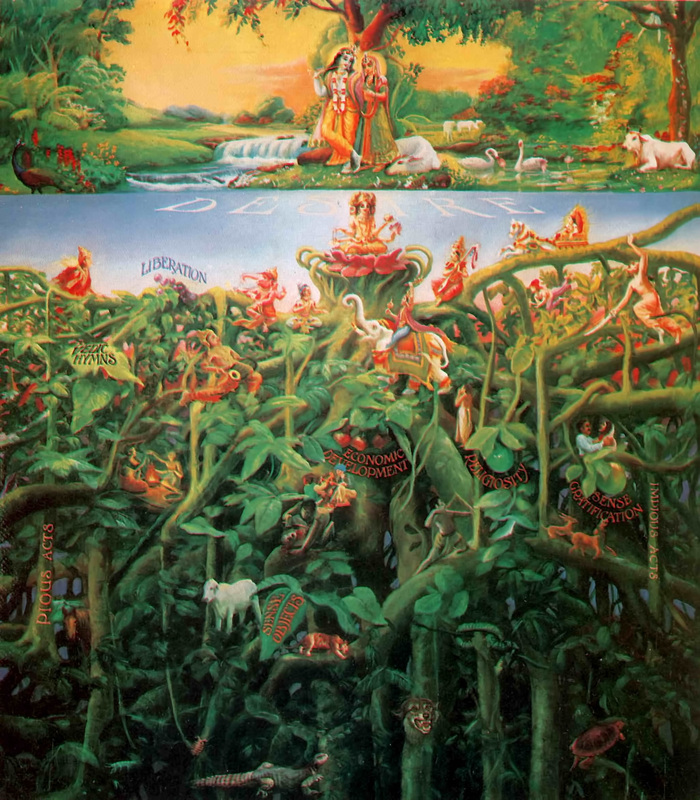 The impersonalists take Brahmā to be the root of this material tree, and from the root, according to sāṅkhya philosophy, come prakṛti, puruṣa, then the three guṇas, then the five gross elements (pañca-mahābhūta), then the ten senses (daśendriya), mind, etc. In this way they divide up the whole material world. If Brahmā is the center of all manifestations, then this material world is a manifestation of the center by 180 degrees, and the other 180 degrees constitute the spiritual world. The material world is the perverted reflection, so the spiritual world must have the same variegatedness, but in reality. The prakṛti is the external energy of the Supreme Lord, and the puruṣa is the Supreme Lord Himself, and that is explained in Bhagavad-gītā. Since this manifestation is material, it is temporary. A reflection is temporary, for it is sometimes seen and sometimes not seen. But the origin from whence the reflection is reflected is eternal. The material reflection of the real tree has to be cut off. When it is said that a person knows the Vedas, it is assumed that he knows how to cut off attachment to this material world. If one knows that process, he actually knows the Vedas. One who is attracted by the ritualistic formulas of the Vedas is attracted by the beautiful green leaves of the tree. He does not exactly know the purpose of the Vedas. The purpose of the Vedas, as disclosed by the Personality of Godhead Himself, is to cut down this reflected tree and attain the real tree of the spiritual world.